Aesop (also spelled Æsop, from the Greek Αἴσωπος – Aisōpos) is the figure traditionally credited with the collection of fables identified with his name. A Greek contemporary of Croesus and Solon in the mid-sixth century B.C.E., Aesop is thought to have been a slave who was freed but eventually died at the hands of Delphians, but nothing is known about Aesop from credible records. In fact, the obscurity shrouding his life has led some scholars to doubt his existence altogether. Greek oral tradition, which for centuries preserved the Homeric epics, similarly passed down Aesop's Fables, and they were among the best-known stories from the ancient world circulated in vernacular European languages. The fables, which today are part of humankind's moral heritage, present essential truths about human nature and right and wrong through colorful anthropomorphic tales. The fable is based on a literary convention of moral turpitude or fortitude meeting its natural consequence. Thus, the tortoise unexpectedly wins the race against the haughty, indolent hare; the lazy grasshopper learns the lesson of hard work from the industrious ants when the winter comes; and the boy who frivolously cries "wolf!" suddenly discovers no one believes him when the wolf really comes. Underscoring values such as honesty, integrity, and frugality, Aesop's Fables are still taught in schools throughout the world and used as subjects for various entertainments, especially children's plays and cartoons. The place of Aesop's birth is uncertain—Thrace, Phrygia, Ethiopia, Samos Island, Athens, Sardis and Amorium all claim the honor. According to the sparse information gathered about him from references to him in several Greek works (he was mentioned by Aristophanes, Plato, Xenophon and Aristotle), Aesop was a slave of a Greek named Iadmon who resided on the island of Samos. Aesop must have been freed, for he conducted the public defense of a certain Samian demagogue (Aristotle, Rhetoric, ii. 20). He subsequently lived at the court of Croesus, where he met Solon, and dined in the company of the Seven Sages of Greece with Periander at Corinth. During the reign of Peisistratus he was said to have visited Athens, where he told the fable of The Frogs Who Desired a King to dissuade the citizens from attempting to depose Peisistratus for another ruler. A contrary story, however, said that Aesop spoke up for the common people against tyranny through his fables, which incensed Peisistratus, an opponent of free speech. 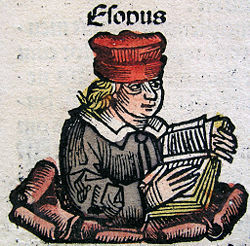 Popular stories surrounding Aesop were assembled in a vita prefixed to a collection of fables under his name, compiled by Maximus Planudes, a fourteenth-century monk. He was described as extremely ugly and deformed, which is how he was also represented in a marble figure in the Villa Albani in Rome. This biography had actually existed a century before Planudes. It appeared in a thirteenth-century manuscript found in Florence. However, according to another Greek historian, Plutarch's account of the symposium of the Seven Sages—at which Aesop was a guest—there were many jests on his former servile status, but nothing derogatory was said about his personal appearance. Aesop's deformity was further disputed by the Athenians, who erected in his honor a noble statue by the sculptor Lysippus. Some suppose the sura, or "chapter," in the Qur'an titled “Luqman” refers to Aesop, a well-known figure in Arabia during the time of Muhammad. Aesop was also briefly mentioned in the classic Egyptian myth, "The Girl and the Rose-Red Slippers," considered by many to be history's first Cinderella story. In the myth, the freed slave Rhodophis mentions that a slave named Aesop told her many entrancing stories and fables while they were slaves on the island of Samos. Aesop's Fables have become a blanket term for collections of brief fables, usually involving anthropomorphized animals. The fables remain a popular choice for moral education of children today. There are many famous stories included in Aesop's Fables, such as The Fox and the Grapes (from which the idiom "sour grapes" was derived), The Tortoise and the Hare, The North Wind and the Sun, and The Boy Who Cried Wolf, are well-known throughout the world. In the Life of Apollonius of Tyana, the first-century C.E. philosopher conveys the secret of Aesop's work. …like those who dine well off the plainest dishes, he made use of humble incidents to teach great truths, and after serving up a story he adds to it the advice to do a thing or not to do it. Then, too, he was really more attached to truth than the poets are; for the latter do violence to their own stories in order to make them probable; but he by announcing a story which everyone knows not to be true, told the truth by the very fact that he did not claim to be relating real events. According to the Greek historian Herodotus, the fables were invented by Aesop during the sixth century B.C.E. While some suggested that Aesop did not actually exist, and that the fables attributed to him are folktales of unknown origins, Aesop was indeed mentioned in several other Ancient Greek works—Aristophanes, in his comedy The Wasps, represented the protagonist Philocleon as having learnt the "absurdities" of Aesop from conversation at banquets; Plato wrote in Phaedo that Socrates whiled away his jail time turning some of Aesop's fables "which he knew" into verses; and Demetrius of Phalerum compiled the fables into a set of ten books (Lopson Aisopeion sunagogai) for the use of orators, which had been lost. There was also an edition in elegiac verse by an anonymous author, which was often cited in the Suda. The first extensive translation of Aesop into Latin was done by Phaedrus, a freedman of Augustus in this first century C.E., although at least one fable had already been translated by the poet Ennius. Avianus also translated forty two of the fables into Latin elegiacs, probably in the fourth century C.E. The collection under the name of Aesop's Fables evolved from the late Greek version of Babrius, who turned them into choliambic verses, at an uncertain time between the third century B.C.E. and the third century C.E. In about 100 B.C.E., Indian philosopher Syntipas translated Babrius into Syriac, from which Andreopulos translated them back to Greek, since all original Greek scripts had been lost. Aesop's fables and the Panchatantra share about a dozen tales, leading to discussions whether the Greeks learned these fables from Indian storytellers or the other way, or if the influences were mutual. In the ninth century C.E., Ignatius Diaconus created a version of 55 fables in choliambic tetrameters, into which stories from oriental sources were added, ultimately mutated from the Sanskrit Panchatantra. From these collections the fourteenth-century monk Maximus Planudes compiled the collection which has come down under the name of Aesop. Men ought not to leue that thynge whiche is sure & certayne / for hope to haue the vncertayn / as to vs reherceth this fable of a fyssher whiche with his lyne toke a lytyll fysshe whiche sayd to hym / My frend I pray the / doo to me none euylle / ne putte me not to dethe / For now I am nought / for to be eten / but whanne I shalle be grete / yf thow come ageyne hyther / of me shalt thow mowe haue grete auaylle / For thenne I shalle goo with the a good whyle / And the Fyssher sayd to the fysshe Syn I hold the now / thou shalt not scape fro me / For grete foly hit were to me for to seke the here another tyme. The most reproduced modern English translations were made by Rev. George Fyler Townsend (1814–1900). Ben E. Perry, the editor of Aesopic fables of Babrius and Phaedrus for the Loeb Classical Library, compiled a numbered index by type. The edition by Olivia Temple and Robert Temple, titled The Complete Fables by Aesop, although the fables are not complete here since fables from Babrius, Phaedrus and other major ancient sources have been omitted. More recently, in 2002 a translation by Laura Gibbs was published by Oxford World's Classics, entitled Aesop's Fables. This book includes 359 fables and has selections from all the major Greek and Latin sources. Towards the end of the seventeenth century, the French fables of French poet Jean de La Fontaine were partly inspired by the Aesop's Fables, although he acknowledges that the greatest part of them is inspired by the original Sanskrit version. Around 1800, the fables were adapted and translated into Russian by the Russian fabulist Ivan Krylov. The first translation of Aesop's Fables into Chinese was made in 1625. It included 31 fables conveyed orally by a Belgian Jesuit missionary to China named Nicolas Trigault and written down by a Chinese academic named Zhang Geng. There have been various modern-day translations by Zhou Zuoren and others. Jean de La Fontaine, the French poet, took his inspiration from the Aesop's Fables to write his Fables Choisies (1668). American cartoonist Paul Terry began his own series of cartoons called Aesop's Film Fables in 1921. In 1928 the Van Beuren Studio took ownership of the series. It ended in 1933. Brazilian dramatist Guilherme Figueiredo wrote a play The Fox and the Grapes (A raposa e as uvas) (1953) about Aesop's life. It was staged many times in the world's finest theaters. The Smothers Brothers, an American musical-comedy team, released a comedy album titled Aesop's Fables: The Smothers Brothers Way in 1965. Seven of Aesop's more famous fables and morals are related in the album. A humorous interpretation of Aesop's fables can be found in the cartoon television series "The Rocky and Bullwinkle Show" in the segments titled "Aesop and Son." ↑ D. L. Ashliman, intro. Aesop's Fables. (New York: Barnes & Noble Classics, 2003. ISBN 159308062X), xxii. Links retrieved May 30, 2007. Bentley, Richard. 1697. Dissertation upon the Epistles of Phalaris… and the Fables of Æsop. London. Handford, S. A. 1954. Fables of Aesop. New York: Penguin. Perry, Ben E., ed. 1965. Babrius and Phaedrus. (Loeb Classical Library). Cambridge, MA: Harvard University Press, 1965. English translations of 143 Greek verse fables by Babrius, 126 Latin verse fables by Phaedrus, 328 Greek fables not extant in Babrius, and 128 Latin fables not extant in Phaedrus (including some medieval materials) for a total of 725 fables. All links retrieved February 15, 2016. Aesopica.net – Over 600 English fables, plus Caxton's Aesop, Latin and Greek texts, Content Index, and Site Search. This page was last modified on 5 February 2019, at 00:24.